→Is Ketosis Safe for Pregnancy and Breastfeeding? Is Ketosis Safe for Pregnancy and Breastfeeding? 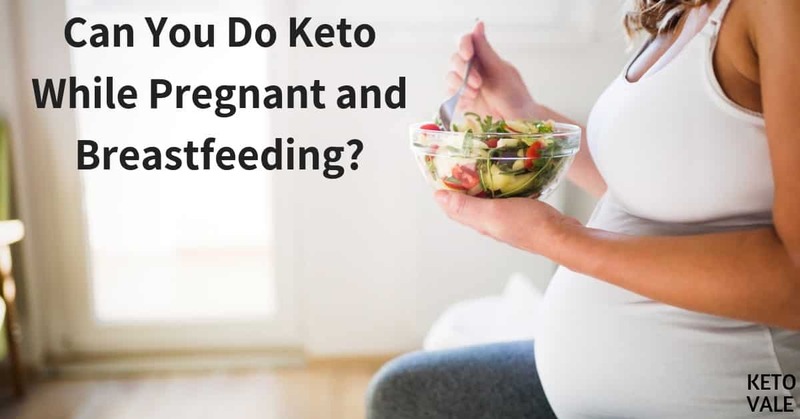 As the keto diet has gained popularity in the past few years, a lot of women are wondering whether staying keto during their pregnancy and while breastfeeding is safe for them and for their child. While there isn’t a lot of research on that topic – it’s mostly an uncharted territory for the moment, with more and more anecdotal evidence from women who decide to give it a go – we’ll still try to shed some light on the topic and discuss it. So, is keto a safe option during pregnancy? Can You Do Keto While Breastfeeding? First of all, in this article, whenever we mention the word “diet” (as in, “the keto diet”), we’ll be just using it as a synonym to “way of eating” and not to “eating in a caloric deficit for the purposes of weight loss”. Dieting for weight loss during pregnancy is not advised, even if you have plenty of body fat that you’d like to get rid of. While the fat on your body might provide you and your baby with the calories you both need, consuming less food might lead to micronutrient deficiencies, and is therefore not advisable. Previously, we have covered the topic of keto for PCOS (polycystic ovary syndrome), and indeed, that’s a condition which affects a lot of women – according to different diagnostic criteria, between 5% and 16% of women are affected, while 50% of the cases remain undiagnosed (1). PCOS directly affects female fertility, and makes getting pregnant and having a healthy pregnancy with no complications much more difficult. Keto has been shown to have a very positive effect on PCOS, helping many women manage their symptoms better and enjoy an overall better quality of life, by lowering weight, fasting insulin, and reducing their free testosterone levels (2). The last part is essential, as normalizing testosterone levels is essential for ovulating, and thus, for being able to conceive. A healthy, low-carb diet might be what is needed to actually get pregnant. Although more research is necessary, studies have already demonstrated that the ketogenic diet can stabilize fertility hormones and improve your chances of getting pregnant (3). In online forums and Facebook groups you can find plenty of anecdotal evidence of women struggling with fertility issues (sometimes related to PCOS, but not only) who have managed to get pregnant on keto, so you might want to reach out to them for support and advice. Is it okay to follow keto diet during your pregnancy? Sometimes well-meaning family members will tell you that during your pregnancy you shouldn’t limit anything and that you should eat whatever you desire. While it’s definitely not a good idea to eat in a caloric deficit during pregnancy (which is stressful for your body and might deprive you and the baby of important micronutrients), there is no need to succumb to all of your cravings, either, and spend your pregnancy gobbling down junk food, for example. The key here would be to maintain an adequate, balanced way of eating, and to make sure you’re getting enough of everything that’s important. This will ensure the health of both the mother and the baby. During your pregnancy, your health (and, therefore, the health of the baby) should be your top priority, and nutrition is a big part of it. micronutrients, i.e. vitamins and minerals, and most importantly iron, calcium, iodine, selenium, zinc, magnesium, folate, vitamins A, C, D, K and B12. Getting enough of each micro- and macronutrient can be managed with a well-formulated keto diet plan, and you should be aiming to consume nutritionally rich foods, such as meat, fish (opt for fish that isn’t high in mercury – sardines and salmon are excellent choices), liver, vegetables (especially dark leafy ones), nuts, and dairy (if you don’t have a dairy intolerance). Getting adequate nutrition doesn’t mean eating everything in excess, and completely giving in to all of your cravings. Some people thrive on a low-carb / keto diet, and they will likely thrive on it during pregnancy, too. A lot of women report carrying and giving birth to healthy babies while remaining in ketosis throughout their pregnancies. Nevertheless, the evidence for this is (for now) anecdotal, and for others it might be a struggle to stay keto. Either way, it’s best to NOT start a keto diet while being pregnant, as it will put your body through the metabolic stress of adaptation, which might result in you feeling less than ideal for a prolonged period of time. If you plan on staying keto during your pregnancy, your best bet is to get fat adapted before you get pregnant, and to give your body enough time to adapt to the changes in your diet. Additionally, some women (who have done keto before that) might find out that they feel better on a slightly higher amount of carbs, such as 50 or even 100 g net carbs per day. If that is your case, just make sure you’re getting them from healthy, unprocessed food, such as vegetables and fruits, and not from junk food. Being in ketosis, on its own, does not put the baby in danger. Ketosis is a normal metabolic state that practically anyone has experience with – if you have occasionally gone without food for 12-14 hours (including sleep) in your life, you have probably already been in ketosis. This is not unusual or dangerous in any way – in fact, the human body is well-equipped for the state of ketosis and can handle it just fine. Food aversions during pregnancy are an unfortunate reality for many women, and these need to be considered, too. While they usually develop during the first trimester, you might experience them later on, as well, and you might also crave a certain food in the beginning and later develop an aversion for it, or vice versa. Foods for which you might develop an aversion include dairy, meat, eggs, spicy foods, tea, and coffee, among others. As you can see, some healthy foods are in there, and if you suddenly develop an aversion for meat and eggs, this might be an issue for getting enough nutrients in, especially if you were relying on them before. If you’re dealing with food aversions, you need to make sure you have good sources of protein, fat and micronutrients. If you develop a food aversion for a big portion of keto foods, consider just staying low-carb in order to get enough nutrients in. If you cannot eat most foods, discuss that with your doctor in order to come up with good strategies on how to deal with this – your body needs energy in order to create life, and undereating during your pregnancy could be dangerous for you and the baby. Some weight gain during pregnancy is completely normal, and it’s actually necessary to support the growing foetus. There’s absolutely no reason to fret over it – you’ll be able to lose the fat afterwards, and keto can be an excellent tool for that. Also, keep in mind that while some of the weight gain will come from fat, the rest will be from water retention, the weight of the baby and the placenta, enlarged breast tissue, blood supply for the baby, and the amniotic fluid (that’s the liquid in which the baby is “swimming”). There is a healthy range of weight gain during pregnancy and it’s approximately in the range of 10 to 35 pounds, which combines all of the different types of weight described above, and depends on your weight and body type before the pregnancy – underweight or very lean women typically need to gain more for a healthy pregnancy, while heavier women normally gain less. The weight gain purely from fat is typically within the range of 5 to 9 pounds, which is nothing excessive, and you’ll be able to deal with easily. Of course, if you’re carrying twins or triplets, you’ll gain more weight – the healthy range then can go up to 50-55 pounds. In the first trimester, the weight that is gained is typically less significant than during the second and third trimester. If you’re starting your pregnancy being very overweight, this might lead to complications for you and the baby; your doctor might advise you on specific strategies on how to minimize the risks. Again – don’t go on a weight loss diet (i.e. a diet where you’re in a caloric deficit) on your own, without thoroughly discussing it with a healthcare professional. How about doing keto while breastfeeding, you might wonder? Is it safe? Is it advisable? Do you risk problems with milk supply and lactation if you do keto? If you’re already fat-adapted prior to starting to breastfeed your baby (which would mean ideally being fat-adapted before you get pregnant), continuing to do keto is unlikely to cause any issues – a study concluded that milk production, lactose, and protein concentrations remained unchanged for women following a high fat diet, compared to women following a diet high in carbs (5). If you aren’t fat adapted, dealing with the keto flu during breastfeeding might not be ideal for how you feel, but will unlikely cause issues with supply. Nevertheless, it’s important to make sure you’re getting enough calories in – a baseline of about 2500 calories a day is recommended by American College of Obstetricians and Gynecologists (6). If keto affects your appetite in a way that it becomes difficult to get enough calories in, you might wish to up your carbs to a certain level, for example, 100 net carbs a day (again, by prioritizing healthy carbs over highly processed and nutritionally void food), to ensure proper nutrition. There isn’t enough research on keto and breastfeeding at the moment, but if you have a diet that’s rich in micronutrients, protein, and adequate fat, you’re unlikely to encounter any major issues. Additionally, to have adequate milk supply it’s essential that you’re staying well-hydrated. The keto diet has a diuretic effect, so it’s paramount that you’re drinking enough fluids if you’re breastfeeding and doing keto at the same time. Electrolytes (and micronutrients in general) are essential, too, to help you not feel tired and light-headed. Strict keto (that is, under 25 g net carbs per day) might not be necessary and while some mothers thrive on it, a more liberal approach to carbs might be the best bet. That would mean, consuming around 50 to 100 g net carbs a day in the form of vegetables and fruits. All of the above is meant as a general advice – if you experience any issues with milk production or if you’re generally not feeling well for any reason (either during your pregnancy or while breastfeeding), you should consult with your doctor, and possibly re-evaluate your approach. Strict keto during pregnancy and breastfeeding is, for the moment, not well-researched, and evidence about it is anecdotal – many women do thrive on it, but for others it might be best to just stick to a low-carb diet that is less restrictive. Pay close attention to the signs that your body is giving you, and discuss any concerns you might have with your physician. A well-formulated diet that doesn’t lack in any nutrients is essential for you and the baby, and proper nutrition is one of the conditions for a healthy pregnancy & breastfeeding. If you’re making sure that you’re adequately nourished, you’re definitely on the right track.